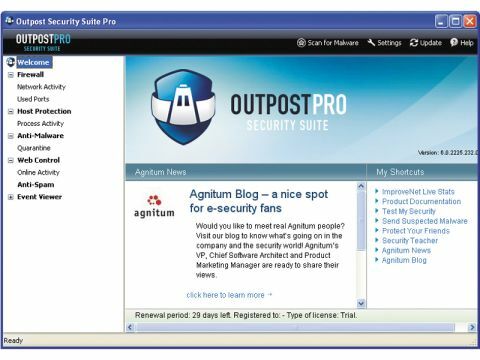 Billed by Agnitum as "proactive protection for intelligent Internet users", Outpost Security Suite Pro 2008 has been reworked to include all the tools required to ensure a high degree of safety. Built around the company's venerable firewall, Outpost's line-up features the core components of virtually all such suites, including anti-malware, anti-spam and Web security controls. Yet at a mere £28 to protect up to three PCs for a year, is this budget suite up to the job? When it comes to the firewall, the answer's a definite yes. This two-way industrial-strength powerhouse gets the job done and also holds the suite together. It runs in stealth mode by default and builds rules for common services and applications automatically, with few on-screen prompts. All our attempts to "leak" data through the firewall were stopped, and try as we might to shut down the main firewall process to exploit the system, we couldn't. Add to this the ability to create custom rules, and the way Outpost provides detailed information about all network activity and open ports, and there's not much more you could ask for in a firewall. The suite's anti-virus/spyware facilities, licensed from Virus Blaster, are well integrated. The real-time protection and scanning options are slick, but we wouldn't recommend relying on the quick scanning method alone. While lightning fast, it's not nearly as comprehensive as its in-depth cousin. Nice features here include not only scheduled scanning, but also the ability to scan specified areas automatically every time definition files are updated. All incoming and outgoing messages are also scanned, with dodgy attachments seamlessly removed. Outpost's anti-spam module integrates into your mail client nicely, but its support is limited to Outlook, Outlook Express and Windows Mail. Whitelist and blacklist support is built-in, and while the program does a fine job of detecting spam from the get-go, helping it by using the integral training function will expedite the module's learning process in the short- to medium-term. Ads are also blocked by default, but for added protection you'll want to move from the "optimal" Web protection setting to "maximum". If you do this, however, you'll probably want to exclude sites you trust (such as your bank) to be sure things work as they should. While there's little doubt that Agnitum has put together an excellent 2008 suite, we can't help feel that this product is still best suited to more experienced users. With so many technical details within the main interface - and plenty more behind the scenes - it could seem intimidating for people new to Internet security. So, if you're an intelligent Internet user and want rock-solid security with the ability to tweak and tune, you'll find plenty to love here.